In the pursuit of sunshine and great weather, Ben has traveled all the way from Grand Rapids, MI. to be with our dealership! Ben owns a 2014 FLHR and 1987 FXR – two incredible bikes that are a blast to ride. 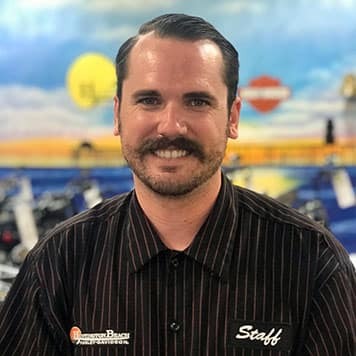 With eight years of experience in the Harley-Davidson industry, you can trust Ben to help you out. He enjoys cooking and is always on the hunt for a good BBQ and dive bar. Ben enjoys the things that make the world better…whiskey, a fine cigar, great food, tattoos, and great friends! Nick’s hometown is Downey, California. However, he comes from Lafayette, Indiana! He prefers to be called Nick opposed to Nicholas. 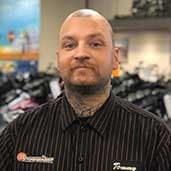 He has been in the Harley-Davidson industry for about a year now. He came to us on his 2005 Dyna. One thing most people don’t know about Nick is that he is a USMC Veteran. Other than selling motorcycles for a living, Nick enjoys surfing (with sharks, mostly), skating and of course, riding. Guillermo prefers his nickname, Memo (which is a lot easier to say). He comes from the city of Angels – Los Angeles, California. 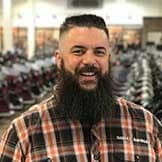 He came to our dealership in search of a new opportunity and stuck with the dealership for going on 4 years now! Memo enjoys singing to himself in his car and is a DJ in his spare time. He’s currently riding a 2017 Street Bob and loves what he does. Eddie, because Edison is way too formal, comes from Westminster, California. 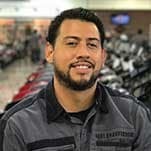 He just joined our Harley family, eager to learn something new about a new career. He enjoys good food and loves to travel to new places! Yvette comes from a large family—she has 27 nieces and nephews! — from Oakhurst, CA. She has been with us for almost four years. If you think you’re seeing doubles, Yvette is an identical twin! 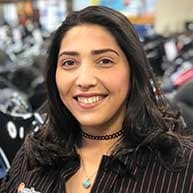 Yvette and her husband ride together on a 2010 Street Glide, while her 2006 Yamaha V-Star 650 just sits and collects dust. Yvette is absolutely smitten with Star Wars, Lord of the Rings, or anything related to science fiction! She’s also our one and only true math nerd. Conway M. L. JR. "Ginger"
Ginger’s hometown is Denver, Colorado (and was attracted to HBHD because of the beach and the sun probably!). Ginger has quite a few nicknames – The Ginger, Ging, Gingy, Gingster, and Gininja! He’ll answer to all of the aforementioned – so feel free to call him from across the showroom! 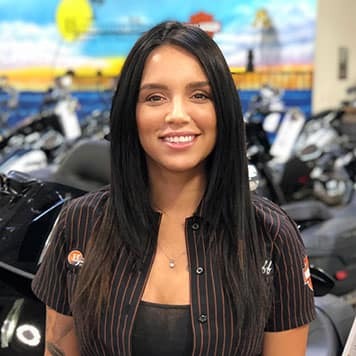 Ginger has been in the Harley-Davidson industry for four years now, and was brought to HBHD because he wanted to work for the best owners in the world! 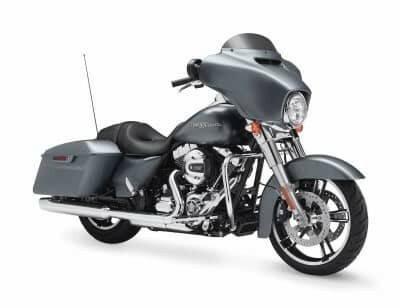 He currently rides a 2016 Road Glide Special. Jeff comes to us from the auto industry side of things. 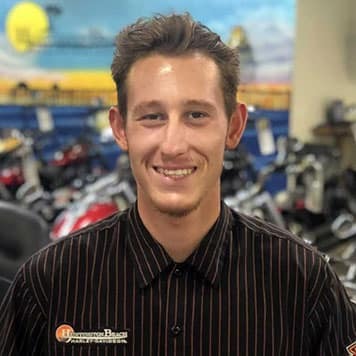 However, it was his love of motorcycles and motorcycle families that drew him to work here. HE currently rides a Ducati Monster and Triumph Tiger…but soon will be adding a Harley to that mix. Fun fact, Jeff is not actually from California. He’s a New Yorker! But he fell in love with our golden state after a family vacation. Paola was brought to HBHD by one of our dear friends, and is brand new to the business. 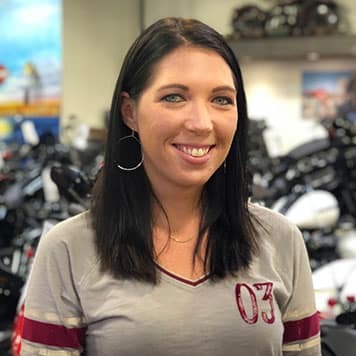 Currently she comes to work on a bright red Radio Flyer trike, but one day she might ride out on an Iron 883, since that is her favorite model. She’s fluent in Spanish, loves dogs, loves to go to the range, and loves to travel. Brought to us by our sales manager Kyle, Monse’s hometown is right here in Westminster. 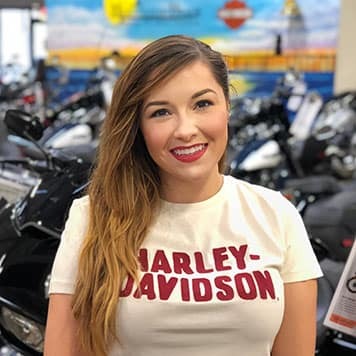 She is new to the industry and her favorite model is the Forty-Eight. She (along with many of the other girls here) is musically talented and can play many different instruments. It doesn’t stop there! She also can sing very well! She will bring her own twist to the bell rings here at HBHD! 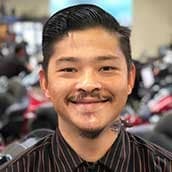 Born in Taiwan, but his hometown being Orange County, Sam came to our doors because of his passion for Harley-Davidson. 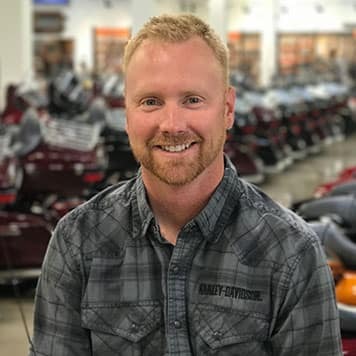 He has 4 years of experience in the business and rides a ‘90 FXR. The only thing he loves more than Harley-Davidson is his family. Nadine is among the many of us here that joined as a result of a purchase. She rides a 2017 Heritage Classic and is currently serving in the Army Reserves. She loves to smile, laugh, and to make people do the same. Catch her at the gun range on her days off! If you’re in the need for a good laugh, come see Nadine! 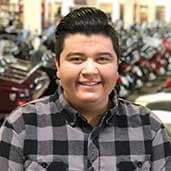 David is from Bellflower, California and has spent 3 years with our dealership! 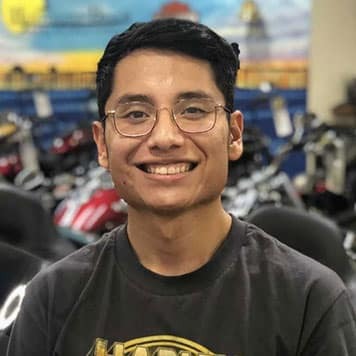 He is an amazing member of the team and his favorite bike is the 2018 FLCHS. 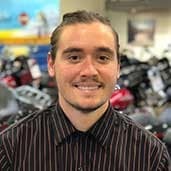 Ryan “Big Baller Balker” was roped into this dealership by his friend, Associate Sales Manager-Nick. He reportedly has 11 toes on one of his feet (making 15 total) and once won a wrestling match against a bear, an alligator, and Chuck Norris. He could be the most interesting man on earth…. 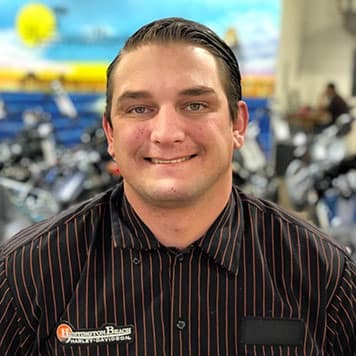 Justin “Rustin” bought a bike with us a while ago and was so enamored with the dealership that he decided he must work here! 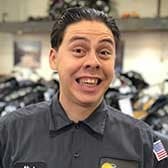 He currently rides a 18’ FXBB & ‘18 FXFBS and never drives a car (he sold it for the 2nd bike!). Justin is of royal blood from Al Masri lineage and is a 1st generation Lebanese American. So, when you see him in the shop be sure to give him the royal wave! Max has a passion for anything with a motor and wheels. 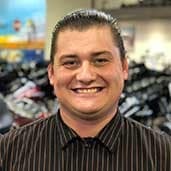 He comes to us from our very own Huntington Beach and loves the 2009 FXD Motorcycle! 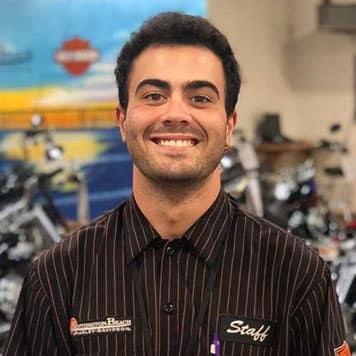 Reed is just starting his journey with the Harley-Davidson company but he has a huge passion for motorcycles. He sadly lost his last motorcycle in a fire and is currently waiting anxiously for the new Street Fighter. Originally from Laguna Beach, Reed is a proud cancer survivor (10 year and counting!) and loves what he calls the 3 B’s: Bikes, Bullets, and Black Coffee! Christina aka “Peaches” is from Whittier, CA. 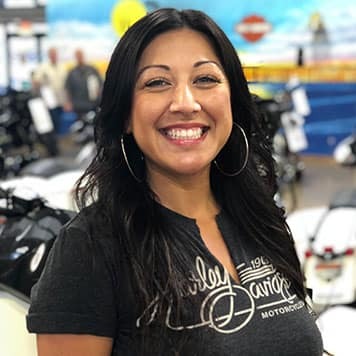 She came to the HB Harley dealership because of its proximity to the beach and her love of motorcycles. She rides an Iron 883 but claims she’s a unicorn! Brett’s hometown is none other than our very own Huntington Beach. 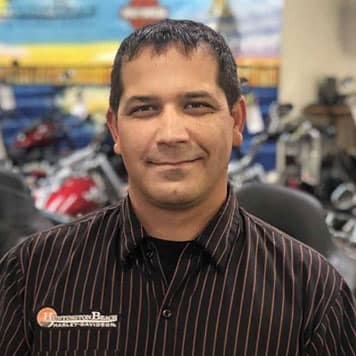 He has been in the Harley business for 1 year and loves everything Harley-Davidson. He loves the ‘17 & ‘18 FCBB models and is a crazy cat person! Cheyenne is originally from Knoxville, Tennessee and she’s not one to shy from standing out. Coming in at 6’6” she played D1 Volleyball in college as you can imagine. 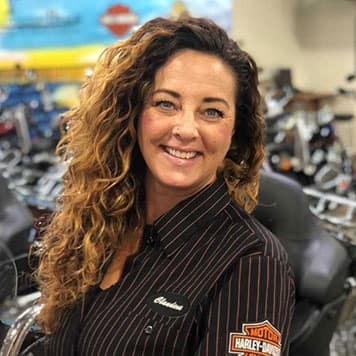 She came to our dealership because of her passion for sales and the legendary Harley-Davidson culture. You can catch her on her days off cruising the Orange County streets on her 48 bike! Johnny is from Redondo Beach, CA. 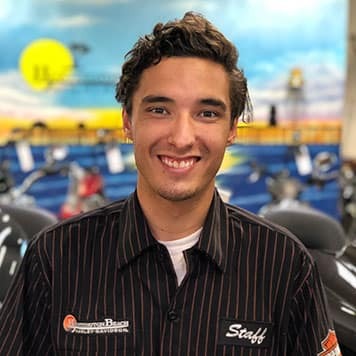 He is new to the Harley-Davidson industry but loves to surf and give back to our community! Austin is originally from Long Beach, CA. 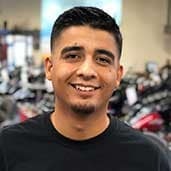 He came to us because he thought Harley-Davidson would provide him with a fun and rewarding career opportunity! His favorite model is currently a Softail Street Bob. On his down time, he loves to hike and travel when he gets the chance! 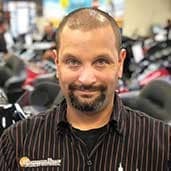 Adrian has about a year experience in the industry and his favorite model is a Road Glide Special. He comes from Covina, California and has a fascination with Japanese cars (second to Harleys, of course). 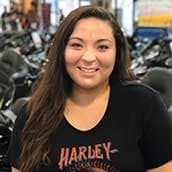 A Huntington Beach native, Sara is new to the H-D industry, but no stranger to sales itself as she has 10 years of experience! 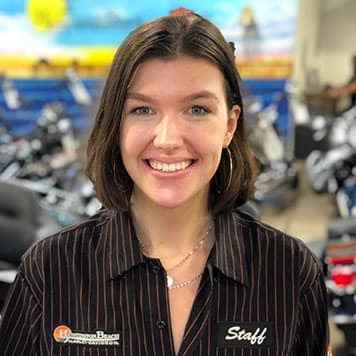 She came to us after initially purchasing Road King- so of course she’s the perfect person to speak with if you’re looking for the same. You may recognize her from Hot-Wheels events as she was a promo model for them for 2 years. Stop by and say hi to Sara, she has guaranteed she will make you laugh! 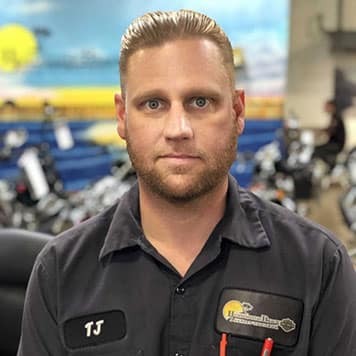 With 24 years of experience in the Harley-Davidson business, James is responsible for keeping our shop running at its fullest potential. James’ hometown resides in the Saddleback Valley, formerly known as Mission Viejo. 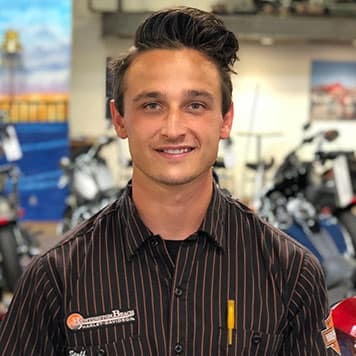 James attended MMI because he enjoys being around motorcycles. After obtaining his degree, he found his way to our dealership! James rides a 2009 FLCHTCU to work every morning and his only regret in life is that he should have been a cowboy. Friendly reminder, if you by chance see him driving a car, steer clear as he admits he barely remembers how to drive one after riding for so long! Tommy, our very own freedom rider, comes from far away, Zellamsee, Austria, to be exact! 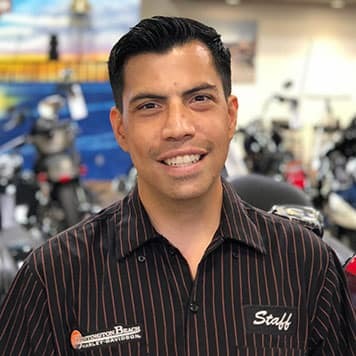 With a passion for motorcycles, he turned to our dealership. He has been with our Harley family for about four years now. Tommy rides to work everyday on a 2001 Dyna super glide T-sport (FXDXT). A really interesting fact about Tommy is that he once yelled, “GET TO THE CHOPPAAAHHH! !” His philosophy is that he will forever be on two wheels. Meet Riun – aka Rhino. 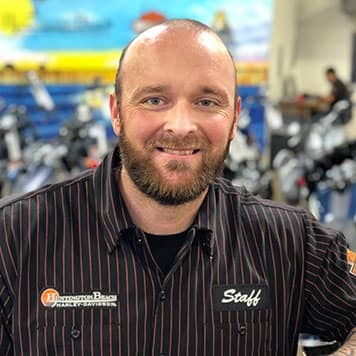 Having been in the industry for 10 years, but it’s been his dream to work for Harley-Davidson. When Riun isn’t at work or at home cooking (he loves to cook! ), you can find him on the road, cruising around on one of his two bikes – a 1990 FXR or his 2002 Road Glide! Luke is originally from Upland, California, where he used to be on the wrestling team in high school. 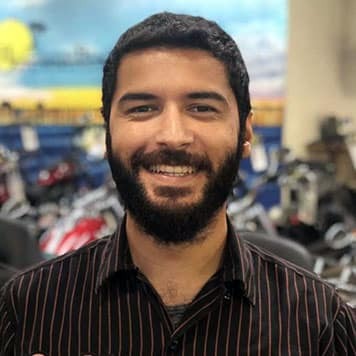 He currently rides a 1998 Sportster Custom and will soon be a proud owner of a XR1200! 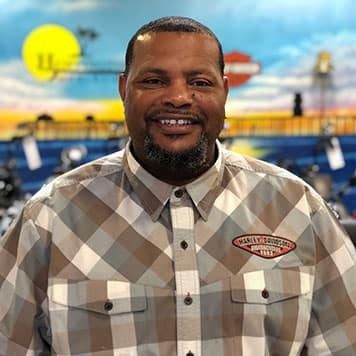 Larry has been working in the Harley business for 5 months now, and he came to us from Huntington Beach, CA because of our high quality of motorcycles. 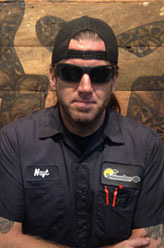 He rides a 2010 Iron 883 and was a body modification specialist for 10 years. His dog, Chance, even loves to ride motorcycles as well!! We like to call Jason by his last name – Hampton! Hampton is in charge of our insurance repair center. He’s a local from Huntington Beach. 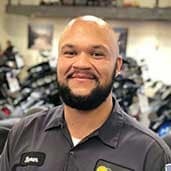 He wanted a career close to his home and community, so he came to our dealership. 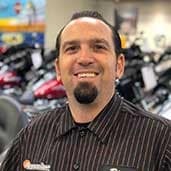 He has 12 years of Harley-Davidson experience under his belt, so you can trust him to get you back on the road as soon as possible. 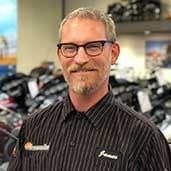 Hampton prefers the Road Glide as his favorite H-D. One thing you absolutely need to know about Hampton is that he is a musician. Come check him out! 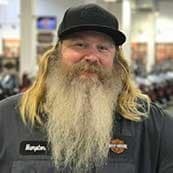 With his hometown being San Gabriel, “Big Ern” has been in the Harley industry for 6 years and counting. He came to us for the passion of the brand (who’s he kidding, he came back it’s the best dealership!) 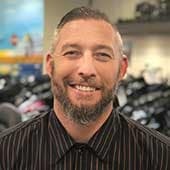 Currently he’s riding around on a 2012 Iron but looking to upgrade to a 2018 Heritage. Random fact, Ernie skated roller derby for 7 years and is now coaching women’s roller derby! 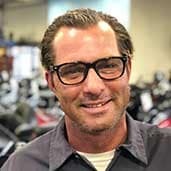 Gordie is from Menifee and is new to the Harley brand. 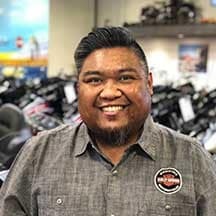 He sought out the dealership because of the well-known family atmosphere and his love of bikes, with his favorite being the Fat Bob. He is pro-dogs and loves blasting his music on the loudest setting. 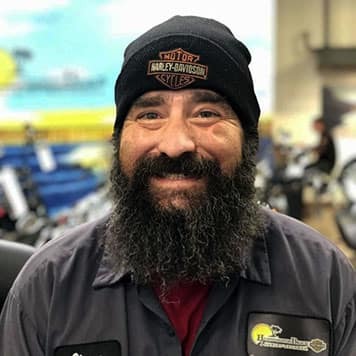 Tony has been in the Harley-Davidson business for 30+ years. 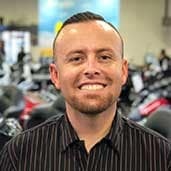 Originally from Anaheim, he is a long time lover of motorcycles whether that be a Harley or even a dirt bike. Anything that moves and lifts his soul makes him a happy man. His favorite food is pizza, so if you feel his work is superb feel free to bring him a gooey, cheesy slice to his desk! Matthew is an Iowan meaning he hails from the wonderful state of Iowa! 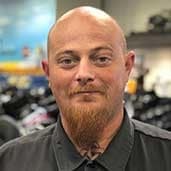 He has been in the Harley industry for 6 years now and loves to ride a 90 FXR, 07 Dyna, or a 2012 Road Glide. Fun fact! He can play the banjo! 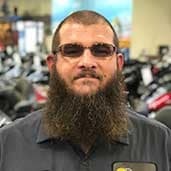 Alvie has been in the Harley business for 15 years! 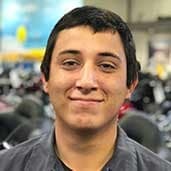 He is originally from Lake Elsinore and rides a FXDI. His kids mean everything to him and he works hard every day to make them proud. Nathaniel goes by Nayt here at the shop. He comes all the way from the east coast—Virginia Beach, Virginia! 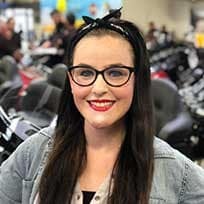 Nayt has been in the Harley-Davidson industry for almost ten years. He doesn’t own a bike, but (maybe) one day will get one. Brad prefers to go by Sam or Sammy, and will only answer to any of those. Sam is a Huntington Beach local! 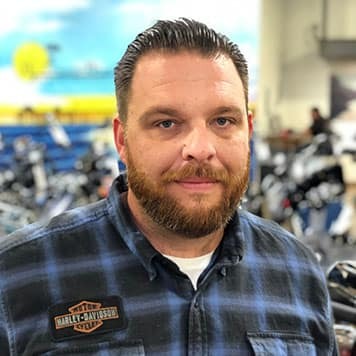 He has been with the Harley business for about 25 years. He was attracted to our dealership because of the great family vibe! He rides a 1992 FXR, and a 2003 Dyna (currently rebuilding from the ground up). Sam is also a huge fan of the color orange! 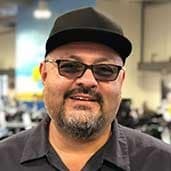 Hailing from Lynwood, California, Mr. Magdaleno came to work for HBHD because of our professional work environment! He prefers to go by “Nacho” – so skip the formality! Nacho rides a special construction motorcycle that he built himself and has been in the Harley-Davidson industry for 12 years. Something else you need to know about Nacho – he’s a photographer! Coming from across the country- Cleveland, Ohio to be exact- Steve came to us in search of a better opportunity. (Look no further, Steve.) He has about 2 years experience with Harley Motor Company and doesn’t plan on stopping there. His favorite bike is a 1923 JDH and loves to cook on the smoker. 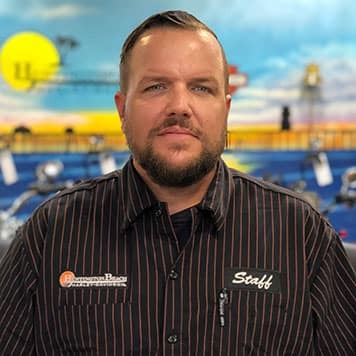 Being a California native, Steve found himself at our dealership to share his love and passion for the Harley-Davidson culture. He has a 2007 Fatboy and has been riding ever since he can remember. 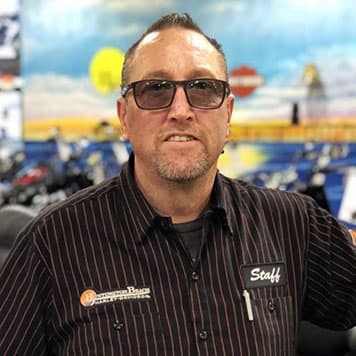 Steve made his first Sturgis trip last year, has 116k miles of seat time on his bike, and constantly looking for new adventures! 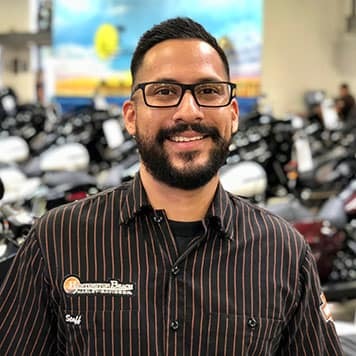 Luis comes to us from Long Beach, CA and rides to work everyday on his KTM RC8 (soon to be a Harley, obviously) and came to us like many, to share his love for motorcycles. He is just starting his journey in the industry and is excited to be apart of such a great team! Random fact, he can hold his breath for five minutes. 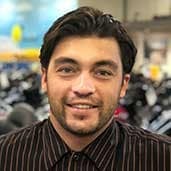 Josh has been with us for about month now here at HBHD, but he has been around Harley-Davidsons his whole life. He wanted to make this lifestyle even MORE apart of his life so he joined our ranks! He rides a 2002 Road King Classic. Something unique about Josh is that he prefers cats over dogs. Nick is originally from Boyle Heights, California. He has been with our team now for 1 year and is always there to lend a helping hand. His favorite bike to ride is a FXDB. 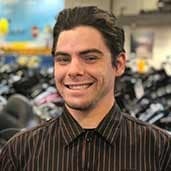 Gino was born and raised in the Huntington Beach area. 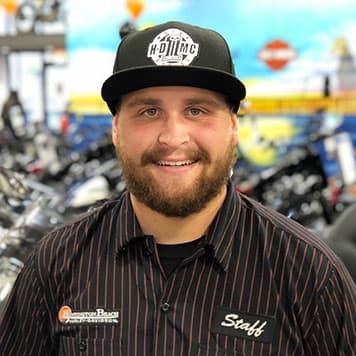 He’s grown up around Harleys and has been on motorcycles since he could walk, so it was only a matter of time before he became part of the HBHD family. He’s currently riding a Yamaha XSA900 and in his free time plays the drums, and yes ladies, he sings. 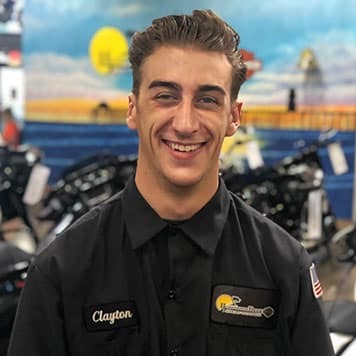 Clayton is originally from Temecula and recently moved to Lake Forest, landing him here at HBHD. 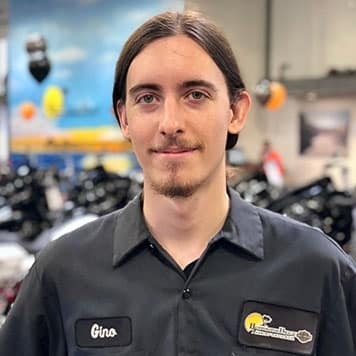 He is new to the industry but his passion for motorcycles makes him no stranger. He loves his FXDL and everything bike related: mountain bikes, BMX bikes, motorcycle, even Radio Flyer trikes. 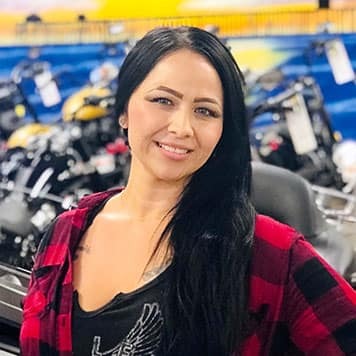 Selena, otherwise known as “Pee-Wee,” has a couple years in the Harley industry and wanted to gain more experience in the field. She comes to us from central California, Sanger, to be exact. 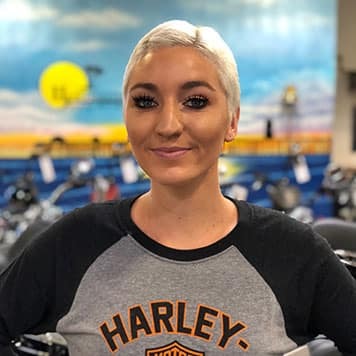 Currently, you can catch her riding down Beach Blvd on an 09 Sportster with her 3 sisters, 5 nieces, 2 dogs, and turtle falling not far behind. Spoiler alert: The easiest way to Selena’s heart, is food, since she’s a major foodie! She goes by “Nikki” or “Crusher,” Brittney hails from Torrance and has about 3 years in the business. 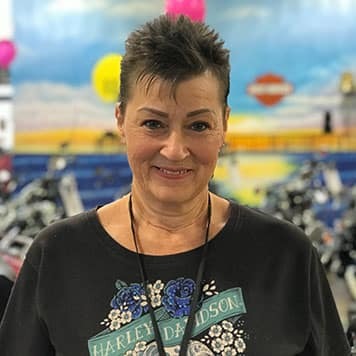 She came to us because the Harley environment is unlike any other and loves being around great people (she was talking about HBHD, specifically.) In her free time she loves to sing and play video games. Watch out guys, she’s a short stick of dynamite, with a whole lotta kick. 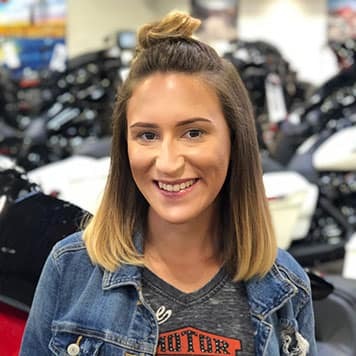 Cassandra, aka Cassie, has been working with our dealership for almost a year now. 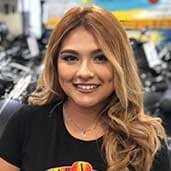 She comes from a family of riders up in North long Beach and her favorite model is a Dyna. She played soccer for 10 year and you can sometimes catch her at the local wing shop eating some yummy buffalo flavored wings. She is working hard to become a future registered nurse by helping delivering babies. Hailing from Riverside, Diana was brought to us buy our dear friend, Mr. JD! 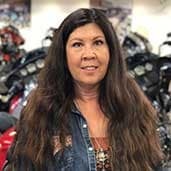 She has well over a quarter of a century in the Harley business, so she is no stranger to the H-D brand! Diana will ride any Harley you put her up against. Interesting fact, Diana loves to quilt! 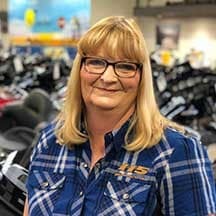 Going by the name Trina, our wonderful accounting specialist came to us some time ago after buying 2 bikes. She was so wowed by our team that she immediately applied. She loves to fly fish and ride a trike-though as a passenger. When she isn’t hard at work, she is throwing the ball around for her 3 lovely dogs! After living in New York and Texas, she arrived in California in 1991. What does she collect? Diane’s love of buffalos stems from being Native American and she collects anything buffalo, which in turn has penned her the nickname Buffy. Diane is a Native American from the Mohawk Tribe from Upstate New York. She doesn’t currently ride but absolutely looks forward to learning! She’s excited to become a part of the HBHD team! 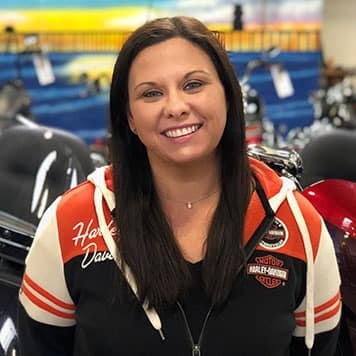 Shannon grew up riding on the back of her dad’s ultra classic’s but now she rides with her husband on thier Dyna. She completed her Freshman year of High School in Saudi Arabia but now she is a mom who LOVES her two kids and one fur baby. Originally from the Bay Area, Savannah has lived and traveled all over the world including Australia and England! 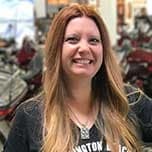 She is new to the Harley-Davidson business but chose to be a part of the brand because of its iconic and great reputation. She has been working in events for many years now and is beyond excited to create fun and lasting memories for all who attend. And while she can only ride a meager bicycle right now, she hopes this job will one day give her the opportunity to learn to ride a REAL BIKE! Susan Biggs is from our very own Huntington Beach. She was coerced by our dealership to come work for us because of her wonderful talents. 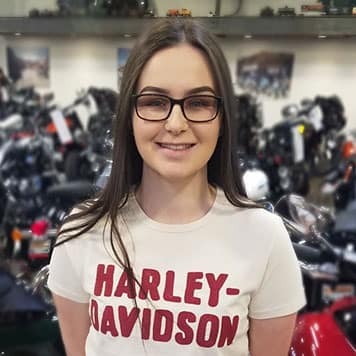 Her favorite bike is a Road Glide and rumor has it that she is exceptional with a Tomahawk! Caitie has already shown us she has a sparkling personality. She says herself that she gets along with anyone no matter what. She aims to always spread kindness before anything! While, she doesn’t have a bike just yet we will work our charms on her and make her a real Harley-Davidson rider!